Angioplasty is a term describing a procedure used to widen vessels narrowed by stenoses or occlusions. There are various types of these procedures and their names are associated with the type of vessel entry and equipment used. For example, percutaneous transluminal angioplasty (PTA) describes entry through the skin (percutaneous) and navigates to the area of the vessel of interest through the same vessel or one that communicates with it (transluminal). In the case of a procedure involving the coronary arteries, the point of entry could be the femoral artery in the groin and the catheter/guidewire system is passed through the aorta to the heart and the origin of the coronary arteries at the base of the aorta just outside the aortic valve. 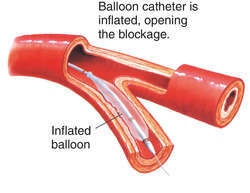 In balloon angioplasty, plaque is pushed out of the clogged artery by the inflation of the balloon device. In individuals with an occulsive vascular disease such as atherosclerosis, blood flow is impaired to an organ (such as the heart) or to a distal body part (such as the lower leg) by the narrowing of the vessel's lumen due to fatty deposits or calcium accumulation. This narrowing may occur in any vessel but may occur anywhere. Once the vessel has been widened, adequate blood flow is returned. The vessel may narrow again over time at the same location and the procedure could be repeated. Angioplasty procedures are performed on hospital inpatients in facilities for proper monitoring and recovery. If the procedure is to be performed in a coronary artery, the patient's care is likely to be provided by specially trained physicians, nurses, and vascular specialists. Typically, patients are given anticoagulants prior to the procedure to assist in the prevention of thromboses (blood clots). Administration of anticoagulants, however, may impede the sealing of the vascular entry point. The procedure will be performed using fluoroscopic guidance and contrast media. Since the decision to perform angioplasty may have been made following a diagnostic angiogram, the patient's sensitivity to iodinated contrast media is likely to known. The procedure may then require the use of non-ionic contrast agents. Angioplasty was originally performed by dilating the vessel with the introduction of larger and larger stiff catheters through the narrowed space. Complications of this procedure caused researchers to develop means of widening the vessel using a minimally sized device. 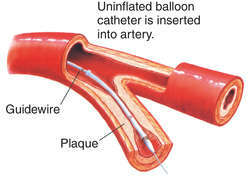 Today, catheters contain balloons that are inflated to widen the vessel and stents to provide structural support for the vessel. Lasers may be used to assist in the break up of the fat or calcium plaque. Catheters may also be equipped with spinning wires or drill tips to clean out the plaque. cardiac catheterization — A procedure to pass a catheter to the heart and its vessels for the purpose of diagnosing coronary artery disease, assessing injury or disease of the aorta, or evaluating cardiac function. EKG — Electrocardiogram, used to study and record the electrical activity of the heart. plaque — In atherosclerosis, a swollen area in the lining of an artery formed by fatty deposits. Angioplasty may be performed while the patient is sedated or anesthetized, depending on the vessels involved. If a percutaneous transluminal coronary angioplasty (PTCA) is to be performed, the patient will be kept awake to report on discomfort and cough if required. PTCA procedures are performed in cardiac catheterization labs with sophisticated monitoring devices. If angioplasty is performed in the radiology department's angiographic suite, the patient may be sedated for the procedure and a nurse will monitor the patient's vital signs during the procedure. If performed by a vascular surgeon, the angioplasty procedure will be performed in an operating room or specially designed vascular procedure suite. The site of the introduction of the angioplasty equipment is prepared as a sterile surgical site. Although many procedures are performed by puncturing the vessel through skin, many procedures are also performed by surgically exposing the site of entry. Direct view of the vessel's puncture site aids in monitoring damage to the vessel or excessive bleeding at the site. Once the vessel is punctured and the guidewire is introduced, fluoroscopy is used to monitor small injections of contrast media used to visualize the path through the vessel. If the fluoroscopy system has a feature called 'roadmap', the amount of contrast media injected will be greater in order to define the full route the guidewire will take. The fluoroscopy system will then superimpose subsequent images over the roadmap while the vessel is traversed, that is, the physician moves the guidewire along the map to the destination. Having reached the area of stenosis, the physician will inflate the balloon on the catheter that has been passed along the guidewire. Balloons are inflated in size and duration depending on the size and location of the vessel. In some cases, the use of a stent (a mesh of wire that resembles a Chinese finger puzzle) may also be used. The vessel may be widened before, during, or after the deployment of the stent. Procedures for deploying stents are dependent on the type of stent used. In cases where the vessel is tortuous or at intersections of vessels, the use of a graph may be necessary to provide structural strength to the vessel. Stents, graphs, and balloon dilation may all be used together or separately. The procedure is verified using fluoroscopy and contrast media to produce an angiogram or by using intravascular ultrasound or both. All equipment is withdrawn from the vessel and the puncture site repaired. During the procedure there is a danger of puncturing the vessel with the guidewire. This is a very small risk. Patients must be monitored for hematoma or hemorrhage at the puncture site. There is also a small risk of heart attack, emboli, and although unlikely death. Hospitalization will vary in length by the patient's overall condition, any complications, and availability of home care. "The angioplasty correct follow up strategy after stent implantation." Heart 84, no. 4 (April, 2001): 363. Carnall, Douglas. "Angioplasty." The Western Journal of Medicine 173, no. 3 (September 2000): 201. "New Imaging Technique Could Improve Outcome of Popular Heart Procedure." Heart Disease Weekly May 13, 2001: 3. "Success clearing clogged arteries." Science News 159, no. 5 (February 3, 2001): 72. "Cardiovascular System" Miami Heart Research Institute 2001. [cited July 5, 2001]. 〈http://www.miamiheartresearch.org/Learning Center/YourCardiovascular…/Cardiovascular.htm〉. "Coronary angioplasty: Opening clogged arteries" MayoClinic.com, Condition Centers, Treatments and Tests. 2000. [cited July 5, 2001]. http://www.mayoclinic.com. "Heart American Heart Association online. 2000. [cited July 5, 2001]. 〈http://www.americanheart.org/Heart_and_Stroke_A_Z_Guide/angiol.html〉. "STS Patient Information: What to Expect after your Heart Surgery." Society of Thoracic Surgeons online. 2000. [cited July 5, 2001]. http://www.sts.org/doc/3563. "When you need to have Angioplast: A patient guide" Heart Information Network. 2000. [cited July 5, 2001]. http://www.heartinfo.org/news97/gdangio111897.htm. an angiographic procedure for elimination of areas of narrowing in blood vessels. balloon angioplasty angioplasty in which a balloon catheter is inflated inside an artery, stretching the intima and leaving a ragged interior surface after deflation, which triggers a healing response and breaking up of plaque. percutaneous transluminal angioplasty a type of balloon angioplasty in which the catheter is inserted through the skin and through the lumen of the vessel to the site of the narrowing. Percutaneous transluminal coronary angioplasty (PTCA). A, Balloon-tipped catheter positioned in blocked artery. B, Balloon is centered. C, Balloon expands to (D) compress blockage. E, Artery diameter opened. From Polaski and Tatro, 1996. Reconstitution or recanalization of a blood vessel; may involve balloon dilation, mechanical stripping of intima, forceful injection of fibrinolytics, or placement of a stent. /an·gio·plas·ty/ (an´je-o-plas″te) an angiographic procedure for elimination of areas of narrowing in the blood vessels. balloon angioplasty inflation and deflation of a balloon catheter inside an artery, stretching the intima and leaving a ragged interior surface, triggering a healing response and breaking up of plaque. Balloon angioplasty, the expanded balloon pressing against a stenotic site in an artery. percutaneous transluminal coronary angioplasty (PTCA) percutaneous transluminal angioplasty to enlarge the lumen of a sclerotic coronary artery. the reconstruction of blood vessels damaged by disease or injury, often performed by inflating a balloon within the vessel lumen at the site of narrowing to reconstitute flow. See also balloon angioplasty. A general term for any interventional repair of a blood vessel. Any interventional repair of a blood vessel. See Balloon angioplasty, Deferred adjunctive coronary angioplasty, Immediate adjunctive coronary angioplasty, Kissing balloon coronary angioplasty, Percutaneous transluminal coronary angioplasty, Primary coronary angioplasty, Rescue adjunctive coronary angioplasty, Rescue renal angioplasty. The treatment of acute myocardial infarction with small doses of clot-busting and antiplatelet drugs, followed immediately (within 1 hr) by balloon angioplasty. The use of laser energy to vaporize an atherosclerotic plaque in a diseased coronary or peripheral blood vessel. A percutaneous method of treating localized coronary artery narrowing without sternotomy. 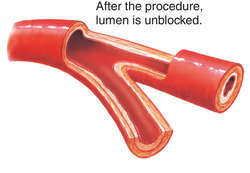 A special double-lumen catheter, designed so that a cylindrical balloon surrounds a portion of the vessel, is inserted through the skin into the right femoral artery. Repeated inflation and deflation of the balloon with pressure between 9 and 15 atmospheres (approximately 135 to 225 psi) dilates the narrowed vessel. In the U.S. alone, hundreds of thousands of coronary angioplasties are performed each year. Modifications in this technique may be used to open blocked arteries in many regions of the circulation, e.g., renal, iliac, or femoral arteries. Preoperative: Angiography is used to confirm the presence and location of arterial occlusions. The cardiologist's explanation of the procedure is reinforced. The patient is encouraged to state feelings and concerns, and misconceptions are clarified. The patient is prepared physically for the procedure according to the surgeon's orders. Baseline data needed for comparison with postoperative assessment data are gathered. Postoperative: Vital signs, cardiac rate and rhythm, and neurovascular status distal to the catheter insertion site are monitored. A Doppler stethoscope should be used if peripheral pulses are difficult to palpate. The catheter site is inspected periodically for hematoma formation, ecchymosis, or hemorrhage. The dressing is marked, and the health care provider is notified of any rapid progression. If bleeding occurs, direct pressure is applied to the catheter site. The patient should keep the punctured leg straight and limit head elevation to no more than 15° to prevent hip flexion and potential catheter migration. The patient is assessed for chest pain, which may indicate vasospasm or reocclusion of the ballooned vessel. Intravenous fluids are administered as prescribed to promote excretion of contrast medium. The patient is assessed for signs and symptoms of fluid overload, i.e., dyspnea, pulmonary crackles, distended neck veins, tachycardia, bounding pulse, hypertension, gallop rhythms. Pharmacological therapy is continued as prescribed (IV nitroglycerin, heparin). Catheter removal is explained to the patient, and direct pressure is applied to the insertion site for 30 min, followed by a pressure dressing. Vital signs continue to be monitored until it is certain that no occult hemorrhage is occurring. Discharge instructions are provided to the patient and family regarding the scheduled return visit with the cardiologist, follow-up exercise, stress testing or angiography, and any exercise prescriptions or activity restrictions (usually patients can walk 24 hr after the procedure and return to work in 2 weeks). The importance of drug regimens, including desired effects and potential adverse reactions, is reinforced. The use of angioplasty to open coronary arteries that remain occluded after intravenous thrombolytic therapy for acute myocardial infarction. A method of widening the bore of an artery narrowed by disease, usually ATHEROSCLEROSIS. A surgical procedure to promote the normal flow of blood to an important part, such as the heart muscle or the brain. 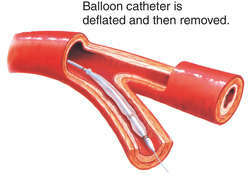 A common technique is BALLOON ANGIOPLASTY. surgical repair of blood vessels or lymphatic channels. dilatation of a blood vessel by means of a balloon catheter inserted through the skin and into the chosen vessel and then passed through the lumen of the vessel to the site of the lesion, where the balloon is inflated to flatten plaque against the artery wall. Called also PCTA. This system is a new technology designed to repair dissections (or tears) in the artery wall that frequently occur as a complication of balloon angioplasty. QT dispersion in coronary artery disease patients was compared with standard normal values and post angioplasty values using Wilcoxon Signed Rank test. These 3 patients underwent another drug-eluting balloon angioplasty procedure and did not experience restenosis at up to 14 months after the second procedure. But the Swiss interventional study on silent Ischemia Type II, which followed 201 patients for 10 years after their heart attacks, showed that heart attack patients who followed their episodes with angioplasty had healthier long-term outcomes than those who just took medication. The study, which took place between 1997 and 2001, included 24 referral hospitals (where angioplasty was not available) and 5 invasive treatment centers (where angioplasty was available) in Denmark. The study was halted after an interim analysis showed a clear advantage for the angioplasty group. Previous studies had showed that up to a third of patients who had the simple balloon angioplasty needed repeat treatment. ANGIOMAX is being examined in patients undergoing angioplasty with heparin-induced thrombocytopenia and heparin-induced thrombocytopenia and thrombosis. According to co-investigator Howard Herrmann, the rate of clinical success--defined as freedom from death, another heart attack, an urgent cardiac procedure, and bleeding--was 85% in the facilitated angioplasty group and 70% for other patients. Late mortality was 13% for angioplasty and 24% for streptokinase; the reinfarction rate was 6% for angioplasty and 22% for streptokinase. Unlike a bypass operation, which involves cutting the artery and rerouting the blood flow, angioplasty requires no invasive surgery, which is favorable. But the study in last week's Journal of the American Medical Association also noted that angioplasty patients often must undergo the procedure more than once during those five years because the arteries clog back up.